A smart looking tote bag that's stylish and practical! Enhance your brands image with these laminated jute bags! They are black in colour and feature a white carry handle, looking fantastic with a white print! The bags are costed here with local stock, if you have some time spare and are after quantities over 1000 let us know, we can possibly do them offshore and save big! 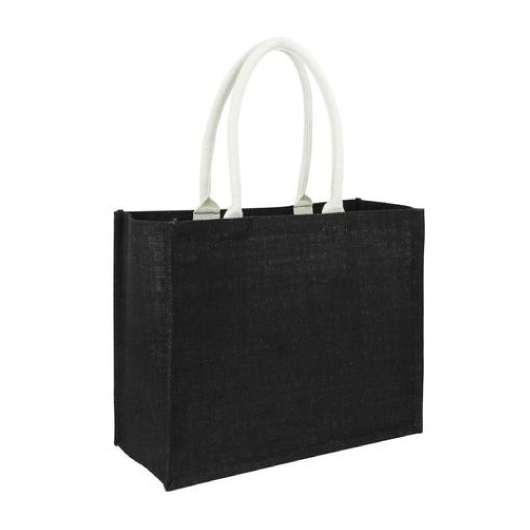 The jute is a 13 x 13 mesh and the bag contains expandable side and base gusset to allow more storage space.